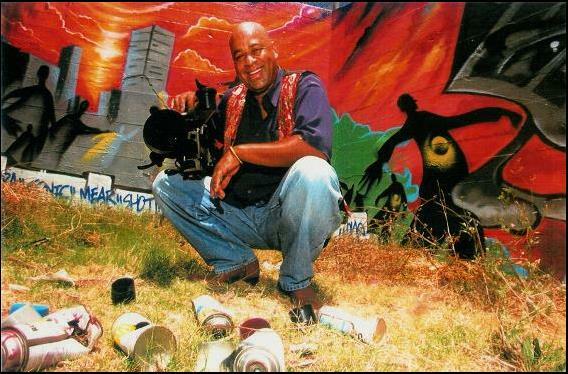 Bob Bryan, maker of “Graffiti Verite’,” with camera in hand at Belmont Tunnel near downtown Los Angeles. There was something strange about the vapor cloud that wafted in front of Bob Bryan that night as he traveled with his family down Melrose Avenue. It was billowing from a storefront near Larchmont Boulevard, followed by a man wearing a face mask and carrying a dripping aerosol can. When Bryan pulled over, the man explained that he was painting graffiti. Isn't that illegal? asked Bryan. No, the graffiti was the backdrop for an opera, the man replied. Intrigued, Bryan hurried back with a video camera to start a six-month journey into a Los Angeles subculture, raising the provocative and controversial question: Can public graffiti be an art form and not merely vandalism?